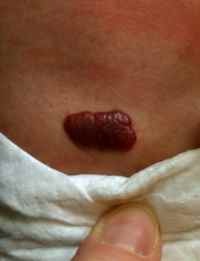 Hemangiomas are common birthmarks in children. They can develop anywhere on a child’s body. Hemangiomas are not typically present at birth, but appear in the first few months of life. Initially they appear red and flat. As they mature they often appear raised, soft and puffy. They slowly grow larger during the first year of life and eventually disappear. Sixty percent are gone by age six and 90% are gone by 9 years old. Most hemangiomas require no treatment. Rarely, hemangiomas may cause problems and therefore require treatment (i.e. an eyelid hemangioma affecting lid closure or lip hemangioma affecting an individuals speech). There are reported cases of large hemangiomas decreasing an individuals platelet count. Until recently, “treatment” meant surgical treatment and potential scarring. There is a relatively new study revealing the effectiveness of a blood pressure medication (propranolol) in expediting the resolution of hemangiomas. While I have not seen this medication used for hemangiomas, I am excited about its potential.